A 76-year-old woman was held at knifepoint in a robbery at a general store. 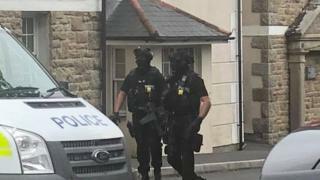 Armed police were called to Lucille's in Penzance at 12:27 BST on Saturday. By the time officers arrived, a man suspected of carrying out the crime had fled the scene. Devon and Cornwall Police said a 44-year-old man was later arrested. No-one was hurt. The woman was taken to taken to hospital as a precaution.